Blinc invented the technology breakthrough in mascara that allows for the easy application of water-resistant “tubes” around the lashes which differs from painting on coverage of conventional mascaras. Once applied, the tubes encase your lashes and will not run, smudge or flake, even if you cry or rub your eyes. 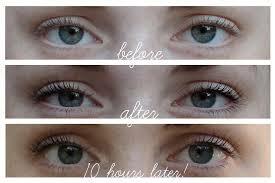 Blinc mascara will add both volume and length to your lashes, giving you a radiant natural look that lasts all day. Only when you are ready to remove Blinc mascara, will the tubes slide off your lashes into your hands effortlessly without the use of a harsh makeup remover, leaving no tint or residue behind. Neither water alone nor pressure alone will remove Blinc mascara. Only the combination of lots of warm water and gentle pressure, from your fingertips, a washcloth or water pressure (i.e. shower), will slide the tubes off your lashes effortlessly. Upon removal, you will actually see tiny tubes in your hand! Blinc mascara has been clinically tested to be non-irritating, making it ideal for sensitive eyes, contact lens wearer, and active people in search of a mascara whose look, hold and ease of removal is unrivaled. It is available in six colors.